The Anterior Cruciate Ligament (ACL) is critical to the support and function of the knee. A tear in the ACL is a serious injury which can mean the end of an athletic or demanding career. Surgical options include repair of the damaged ligament vs complete reconstruction with a patient’s own tendon. Complications include infection, blood clots, technical failure, damage to muscles, tendons and associated ligaments and the change in the biomechanics of the knee. EK is a 31 y/o athletic officer at one of the nation’s military academies who sustained a tear in his ACL. He opted for a non-surgical therapy. 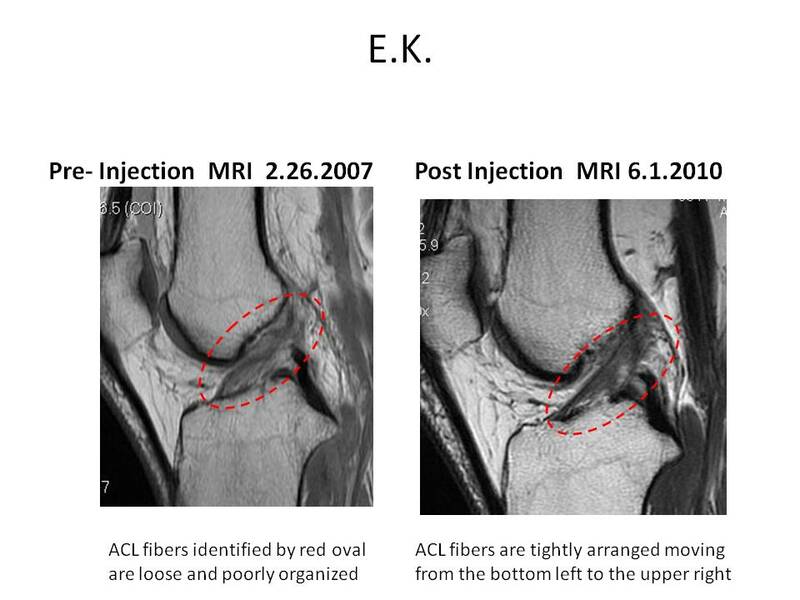 Below is EK’s MRI prior to and 1 month following x-ray guided injection of prolotherapy. The patient reported improved stability and reduction in pain. This corresponds with the changes noted on MRI. The ACL is identified by the red ovals. On the left the ACL fibers are loose and poorly organized; they meander upwards rather than appearing tightly stretched. 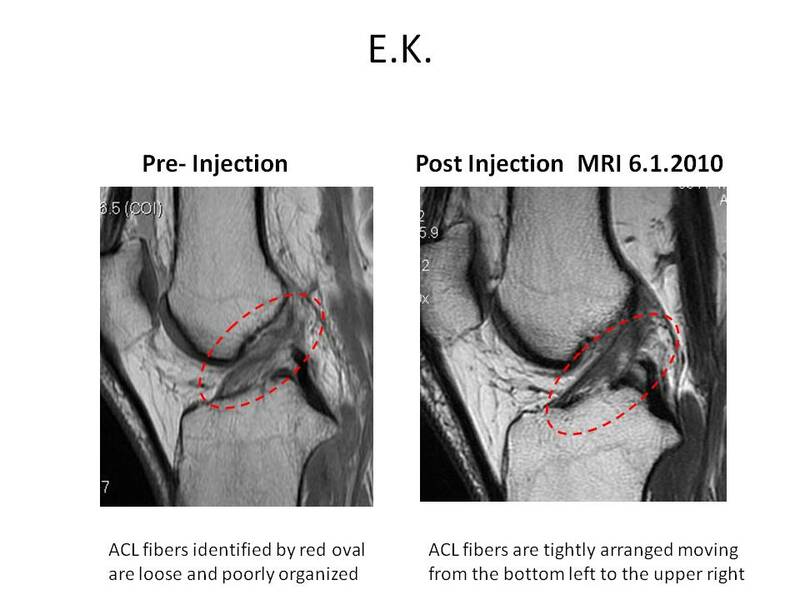 In the post-prolotherapy MRI on the right, the ACL fibers are tightly arranged moving from the bottom left to the upper right. The fibers now appear to have a denser appearance (darker in this image). 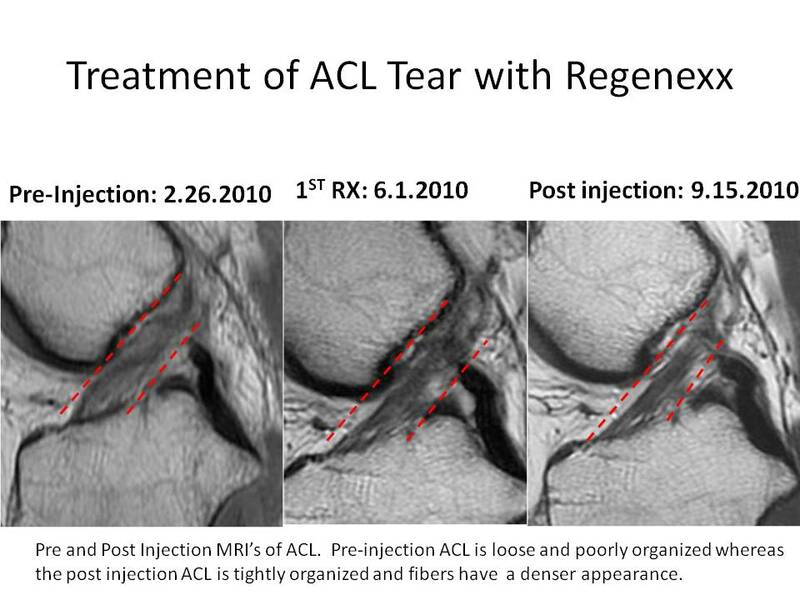 Patient is scheduled to have re-implantation of expanded mesenchymal stem cells directly into the ACL next week utilizing the Regenexx procedure. At the Centeno-Schultz Clinic different regenerative therapies are available which allow patients non surgical options for common orthopedic injuries. Therapies include prolotherapy, PRP, platelet derived growth factors and expanded mesenchymal stem cells.